Bob Whittington deftly demonstrates that, throughout history, conquests, defeats, power struggles and pride have all been orchestrated through our long-standing obsession with money. In this extract Whittington explores the Iron Age, and the dominance of the Romans in Britain, to map out how currency has evolved through the ages. Ever since the first coin was struck from electrum (an alloy of gold and silver), probably around 600 bc in Asia Minor (present-day Turkey), we have been obsessed with money. 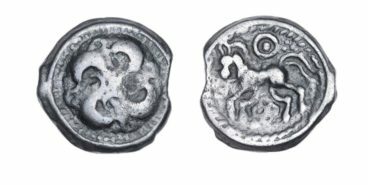 Coins tell us about kings and queens; they mark the transfer of power, and they trace the relationships and influences of neighbouring countries between and on each other. For collectors they are objects of beauty and value; in days gone by they would have been worn as adornments and jewellery. For our story they are the signposts along the way as ancient Britain struggled from being an island of independent warlike tribes, fighting for survival among themselves and from outside invaders bent on pillaging and conquering, to a nation which would eventually have imperial ambitions of her own. Monarchs have minted it and manipulated it, hoarded it and squandered it, but all have relied on money as they campaigned to acquire lands and establish their right to the throne. In modern times coinage has been used to mark special occasions rather than to signify and underline authority and power. Coins are the tell-tale evidence throughout history of conquests and defeats, of power struggles and pride. They also mark changing attitudes and values – how we moved from bartering for goods to cash for everything, from buying bread to bribery. Once they were rare, rough and ready, and had to be weighed to calculate value; today they are milled, engraved, and polished. In time we may do without coins altogether in our electronic and digital world, or we may even revert to bartering once again as some do today, trading what they have or can grow in exchange for items they desperately need but cannot afford to buy with money. Money Talks traces British history through the one thing that has come to dominate our lives – hard cash. It looks at what was happening to the country as it emerged from its early history and royal struggles with cash flow problems to modern times, and sees what the thrymsa, the penny, and the groat have to tell us about those times and the people who used them. It may now be decimalised, it may even move virtually at the swipe of an electronic card, but money has survived for more than 2,500 years, rising and falling in value, changing in shape and size, and merging into a continent-wide single unit. The coin will go on talking, telling its own unique tale about the lives we lead, the challenges we face, and the dreams we are trying to turn into reality. Hard as many Britons might find it as we rail against Europe and its perceived interference in our way of life, clinging proudly to our independence as an island nation while conveniently forgetting how often we have been invaded, the first coins we used were actually from what is now France. They were minted by a Celtic tribe in Belgica. The Belgae was a loose grouping of tribes with different ethnic origins – those in modern-day northern France were Celtic Gauls. The period we refer to as the Iron Age stretches from 800 bc to as late as ad 100, well into the Romanisation of Britain; in Scotland, which the Romans tried and failed to conquer, it reaches into the fifth century ad. During this time the Celts were the dominant group in north-west Europe, eventually arriving in Britain around 100 bc. 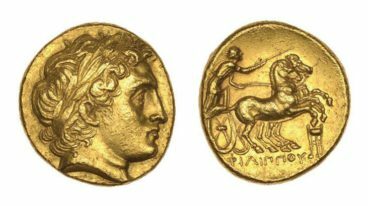 To add insult to injury as we watched Greece stumble under the burden of impossible debt in the twenty-first century, that first coin was a copy of the beautiful gold stater of Phillip II of Macedonia (382–336 bc), father of Alexander the Great. Britain, although of course it only became a united country under that name by the Act of Union in 1707, was a long way behind. Even when the first coins called potins were cast by metallurgists in Britain around 80 bc, probably by the Kentish Canti tribe, the workmanship was rudimentary by comparison with the stater. The technology for producing the potin would have arrived with the first waves of Belgic invaders, who settled in present day Sussex, Berkshire, and Hampshire. The coin was an alloy of bronze with a high percentage of tin – there was plenty of alluvial tin to be found in south-west England. At this stage the notion of stamping a leader’s profile on a coin had not started, and typically a god like Apollo would feature on one side with a bull, a boar, or a horse on the reverse. others, at the Battle of Sabis in northern France in 57 bc. Caesar appointed Commios as ruler of the Atrebates and sent him as his envoy to Britain in 55 bc, in advance of his first expedition to try to persuade the Britons not to resist his invasion. However, Commios was promptly captured by the Britons, who hoped to dissuade Caesar from attacking. Of course, that plan failed, Commios was released, and he went on to help Caesar’s legions resist further attacks. Commios excelled again during the second Roman expedition to Britain in 54 bc, when he negotiated the surrender of Cassivellaunus, the chieftain who led an alliance of tribes against the Romans. Commios was left in charge and in due course declared himself King of Atrebates, controlling a territory comprising present-day Surrey, West Sussex, and Hampshire. 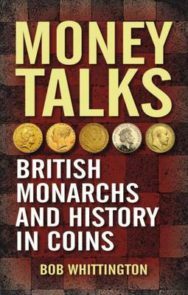 Money Talks: British Monarchs and History in Coins by Bob Whittington is out now published by Whittles priced £16.99.